While I think shopping’s fun, I’ve never cared much for a mall. I love flea markets! Tag sales and antique/thrift stores are fun, too. Items that have withstood time or have a past history are interesting. Like many Farmgirls, I’m passionate about vintage items, and love anything glass! When glass is colorful, it’s even more tempting! My childhood kitchen was red, colorful and inviting. Sure, there were gold appliances popular in the 70’s, but there were also red-and-white-checked cafe curtains mom had sewn herself, and a big strawberry McCoy cookie jar that was always filled. It was a big eat-in kitchen, but on holidays we sat in the dining room using tableware reserved for special occasions. 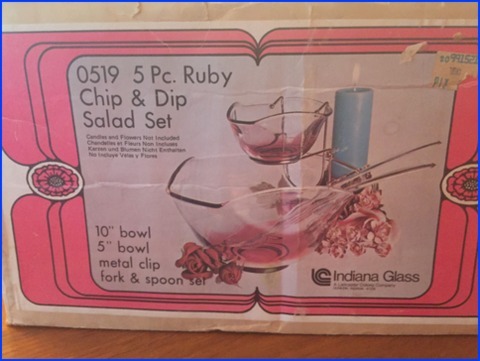 Mom’s ruby-colored crystal water glasses graced the table on those occasions, and then stored in the credenza for safekeeping. 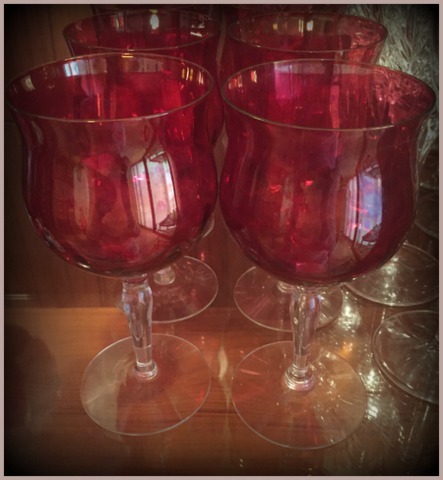 The goblets would make the sweetest twinkling sound as we’d tiptoe by the credenza. I remember how I loved the way water looked in those iridescent cranberry glasses! I knew I was a “big girl” when I drank water from one on a special holiday. As an adult, Mom gave them to me as a housewarming present. How they survived shipping is a miracle! Mom bought her water goblets in 1964 from Foley’s Department store. Today, they’re stored in my china cabinet, but I don’t often use them, and my daughter’s never sipped water from one! They’re so delicate with thin rims – I’m afraid I’ll break one! (They still make that familiar “tinkling” sound when my footsteps vibrate the cabinet). Last fall, I was in a thrift store with one of my friends when she spied a set of glasses and a pitcher. She exclaimed, “Nicole, that just screams “you”! Not knowing what the set was, I could tell it was old, probably from the 1950’s. Clear at the top, the bottom half of each piece is a pretty cranberry red. It was love at first sight, and I was thrilled with the price tag: $4.00 for the whole set! Bringing my new treasure home, research revealed it was a “Blendo” set. “Blendo” glass, made by the West Virginia Specialty Glass company, was most popular during the 1950’s and 1960’s, when colorful dresses wore worn with colorful aprons and cocktail parties were a popular past time. Blendo glass came in a variety of shapes and colors, and featured pitchers, glasses, cocktail shakers and serve ware such as salad sets and cruets. Today, Blendo’s popularity is increasing again. Collectors can find really reasonable prices on pieces at thrift stores, tag sales, and online through Facebook, Etsy, and Ebay. 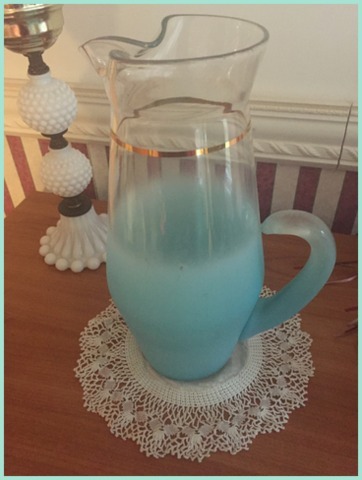 This tall Blendo pitcher is a “frosted” example. It’s recognizable by the clear glass that “blends” into a rainbow of colors such as blue, orange, yellow, pink and more. The “frosted” pieces have a cool, refreshing look that begs to hold cold lemonade or iced tea to be served on a hot day. 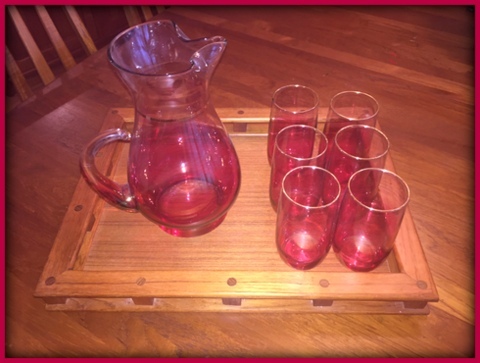 I love my cranberry red set, as it blends (pardon the pun) with spring, summer, or fall decor, as well as served me well (no pun intended again) at the holidays. Just use care to always wash by hand, and do not use harsh detergents, because the color can fade and flake off if handled improperly. That same friend found another piece of the same color for me at Christmas. This piece is a small footed pitcher with a glass stirrer, shaped like a very large brandy snifter. 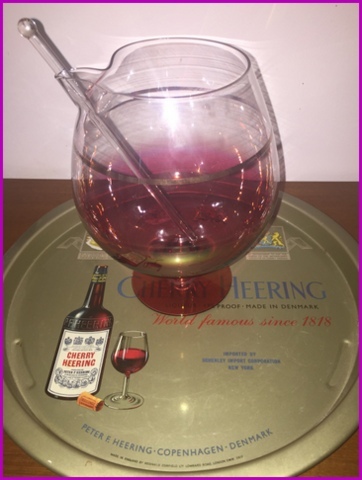 This was used in the cocktail era to serve large batches of martinis. I think it’s adorable! I love tin trays, too. The vintage one this Blendo piece is on is vintage from Denmark (like my husband, hee-hee). Another friend and I have a tradition at Christmas, the “Vintage Gift Challenge”. Our gifts to each other must be vintage and under $10. 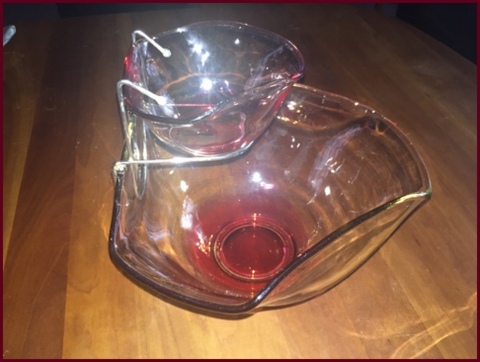 This year, she gave me a chip and dip set in the same cranberry color as the pitchers and glasses! Oddly, she found it in a store and put it away before I ever found that first pitcher and glass set! I’m so lucky to have friends that really know me! The shape of the bowls are unique, and if you turn the little bowl around on the stand, it becomes a salad set… genius design! My particular set came in the original box, made by Indiana Glass, but similar pieces are listed on eBay under “Blendo”. Can’t you just imagine ladies of a bygone time, in pearls and heels, getting together for a game of bridge and serving munchies in colorful glass? If you spy a beautiful, old glass pitcher or serving piece by West Virginia or Indiana glass, snap it up. The pieces recall another era, but are still beautiful today. Try a colorful Blendo pitcher filled with flowers as a vase, or use a bowl as a centerpiece. 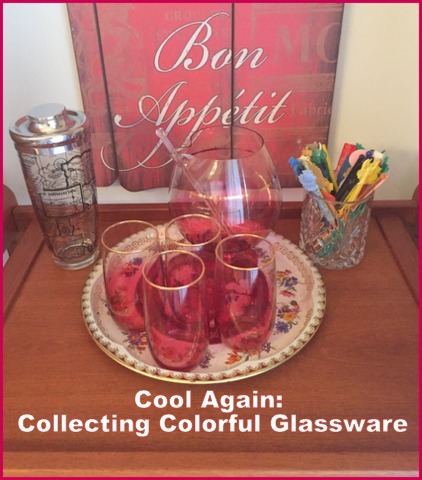 Tell me, are you are a Blendo or vintage glassware fan, too? What’s your favorite color of glass? Happy New Year! I’m not much of a “resolution maker”. Instead of looking at what needs “fixing”, I reflect on what was great or what was accomplished. I do keep a “bucket list” – adding and crossing off as I go through this adventure called life. 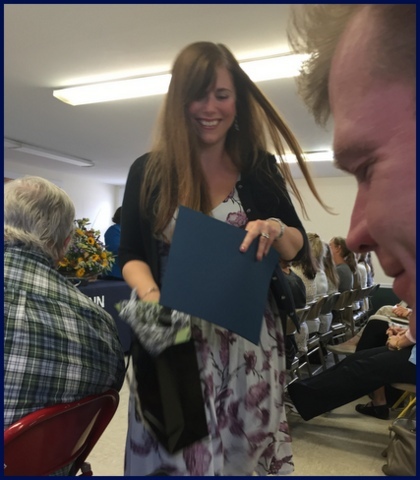 2015 was wonderful, and I’m thrilled I completed something I wanted to for a very long time: becoming a Certified Master Gardener! I began gardening at age seven, when my dad and I planted our first veggie garden in Houston, Texas. In the early 70’s, I was also my dad’s “helper” when we planted pine tree seedlings along the fence line of my dad’s ranch in the Texas hill country. Those trees are still there, sky-high and thriving. 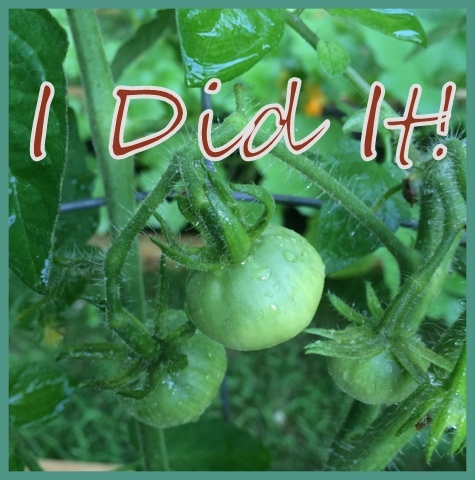 From then on, I was hooked on all things gardening! I am always so happy in my garden and flower beds. 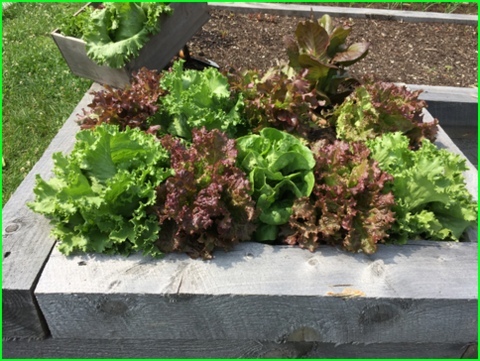 Relocating to Connecticut over twenty years ago, I had to learn planting in a completely different zone with a totally different climate, adapting my gardening and choice of plantings to suit the area. 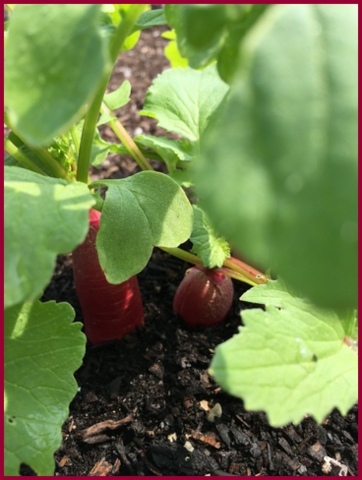 (Master Gardeners have a great mantra: “Right plant, right place” – best garden advice ever)! 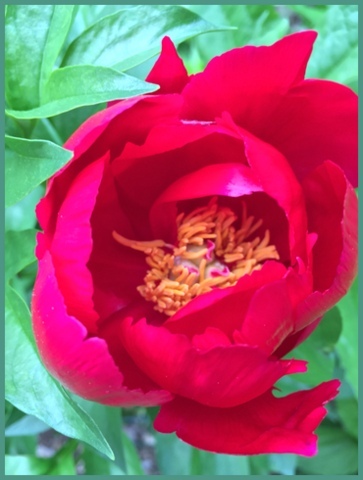 For years I’ve admired a nearby home with its beautiful yard and garden, belonging to a Master Gardener, and my father and I long talked about how wonderful it’d be to have Master Gardener training. I decided finally not to talk about it anymore, but to do it. Started in 1972, Master Gardener programs are offered throughout the country at county Cooperative Extension Centers through land grant universities. Interns in the program are trained in the science of gardening and horticulture; in return, they become volunteers – passing what is learned to the public. Programs emphasize doing the “right thing”, and the education is research proven. The amount of time to complete the course varies, but Connecticut requires one of the longest amount of hours, and is very environmentally focused. 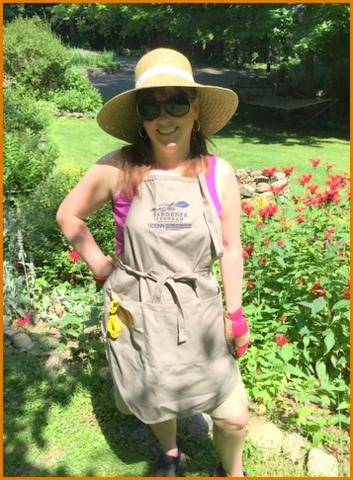 According to Julia Cencebaugh, Master Gardener Program Coordinator, Fairfield County Extension, there are around 100 Connecticut Master Gardener Interns each year. The course is offered through the University of Connecticut County Extension near me every two years. I excitedly filled out the application and in December 2014, learned I’d been accepted to the program. I couldn’t wait for January! Once a week for four months, January to April, the 2015 Master Gardener Interns would take an all-day class. Each week’s class was a different subject: topics like botany, plant pathology, entomology, IPM and more. I’d go home at the end of the day, tired but exhilarated by what we learned – joking after each class that my brain had a new wrinkle! I couldn’t wait for planting season to put what I learned to use! 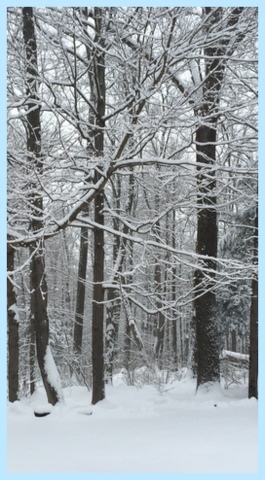 It was a long, cold winter; those gardening classes made the cold season fly by. We interns were all different ages and backgrounds, but shared a common interest and goal. In addition to classes, we took a written midterm exam, and a diagnostic final, where we had to identify the plant and/or the problem. I was so nervous – I hadn’t taken a test in decades! We also had to complete a “TSV” – tree, shrub, vine project, and were given a list of plant specimens to find and research. For nine months, I snipped, dried and stayed up past my family’s bedtime pasting specimens, researching and typing. 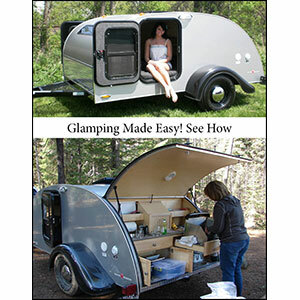 At first I was intimidated by the project, but soon enjoyed it. I learned more than I could’ve imagined! 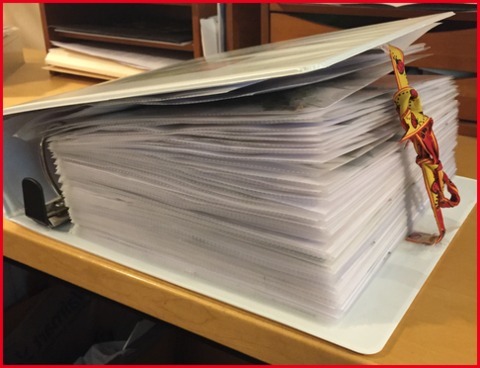 My TSV binder is thick! It’s now a helpful reference and a treasured souvenir of my year. 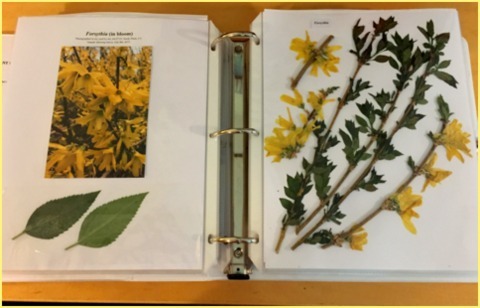 A page from my project showing forsythia. It wasn’t easy because I had other commitments, as well. I blog, I’m a Scout leader, I teach classes; I have a husband and daughter, we’ve pets and chickens to care for and a home to maintain. I have my own garden, as well. But this was something I wanted to do; I was determined to see it through. I was amazed how much I didn’t know, learning universal Latin plant names, and noticing details like leaf galls or insect damage. A new world was opening up as I spied plants, leaves and bugs everywhere. It was fascinating. I relished learning about my areas’ trees, something I didn’t have much knowledge of. 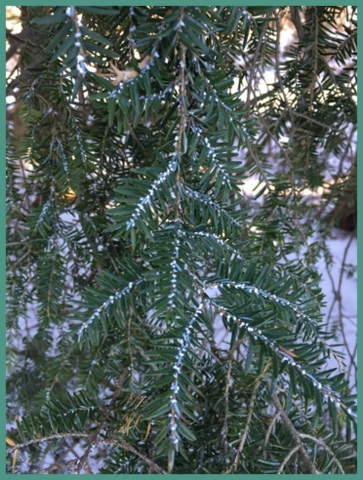 (Before, all evergreens were “Christmas trees”). Now I know what different trees are, how to care for them, and to watch for signs of disease. This serves me well, since our property is partially wooded. 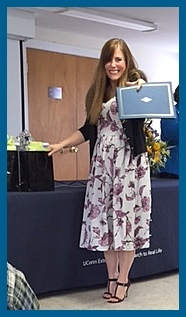 Before graduation, each intern must complete sixty hours of service, thirty volunteering in the office and thirty volunteering for an outreach project. I enjoyed the office hours. My mentors were amazing teachers! 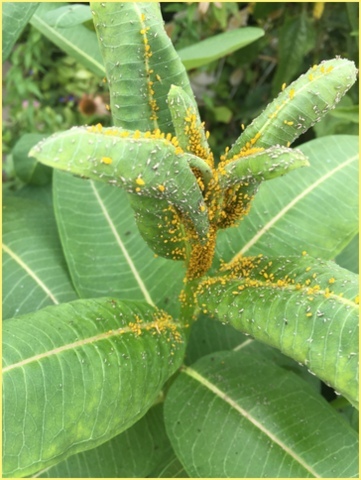 It was exciting being able to answer questions on plant issues for clients, or acting as a sleuth – identifying a “mystery” plant brought in. Proud to wear that apron! I logged in about 75 hours this year, but there are MG’s who have hundreds (even 1000!) of hours of service under their belts! For my other hours, I chose to work in the Master Gardener Demonstration Garden (http://www.fairfieldcountydemonstrationgarden.com/) right on the Extension property. 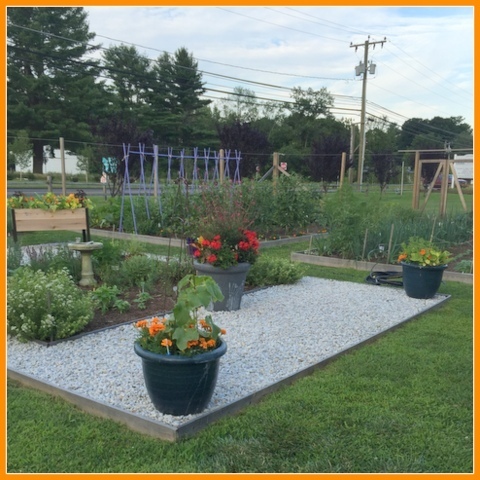 Designed in 2013 by a dedicated group of Master Gardeners, the garden is the crown jewel of the extension center. We learned so much from each other; the garden is beautiful and inspiring to everyone who sees it. 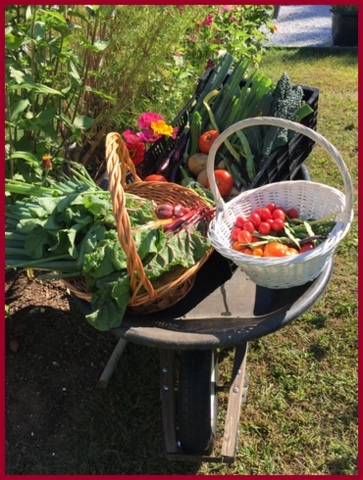 All food harvested goes to local food banks. I look forward to volunteering there again. A panoramic of the garden early in the season. 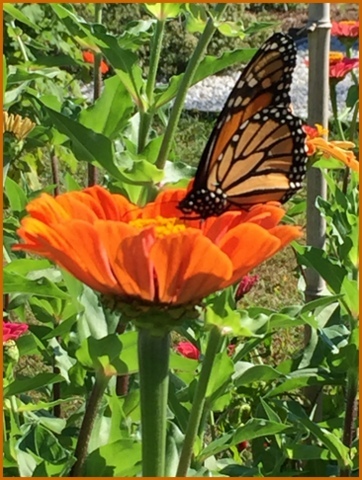 A monarch visits one of the Demo Garden’s flowers. One day’s harvest to be donated. 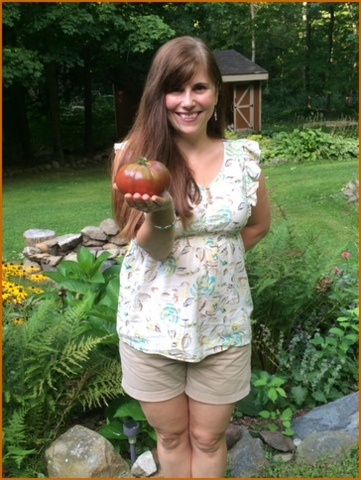 A real sense of community is felt in the Demonstration Garden, growing all-organic produce. The garden is the result of many volunteers putting in a lot of hard work! In late October, we graduated. I’m proud of the hard work, cherishing the camaraderie I found in my fellow Master Gardeners. Master Gardeners have varied garden interests, and are trained to help others with things plant-related. 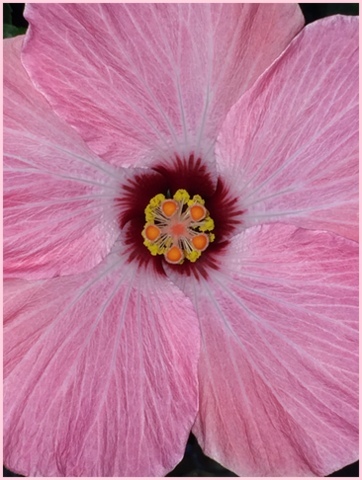 With gardening one can never know everything – there’s always something new to learn and share. I might not know the answer immediately, but I know how to find the correct one. In 2009, there were 95,000 active Master Gardeners nationwide. Got a plant-related question? Call your local Extension and speak to a Master Gardener. They’ve worked hard to be able to help! Wishing you a Happy New Year (and happy seed-catalog browsing – ’tis the season to find them in our mailboxes)!